Katriona McFadden, a reporter from Mooney on RTE Radio 1 in Ireland, is currently walking the Camino de Santiago with her fiancé JP. Katriona is walking the last 110km of the French Way, starting ‘full of vim and vigour’ in the town of Sarria and finishing in Santiago de Compostela. The Mooney Show is broadcasting Katriona’s 3-part Camino Diary this week, where she shares her experience as a pilgrim. Along the way, she has been meeting some extraordinary people, as well as dealing with the Galician unpredictable Spring weather! Nothing a couple of rain ponchos couldn’t fix, though! On her fist day walking, Katriona and JP met Bill and Sharon Mayhall, an inspirational couple from Tucson, Arizona. They are 70 years old, have four knee replacements between them and Sharon is currently receiving treatment for cancer. 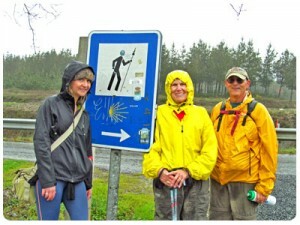 Nothing would stop them walking to Santiago, not even the wet weather! On day three, she met a family from South Africa walking the Camino and spending quality time together. And it is not just about the walking, the kids also had time to unleash their creativity and come up with their own ‘Camino Rap’. In between rain showers and sunny spells, there is also time for a bit of a well-deserved bite. 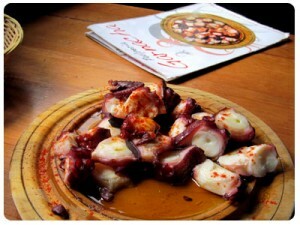 In Melide, Katriona stopped to taste some Galician traditional dishes at Casa Garnacha. Some useful Camino tips from Katriona’s travels so far? Tune in to RTE Mooney from 3-4,30pm (Irish time) this week (Tuesday, Wednesday and Thursday) to hear Katriona’s Camino Diary and her interviews with fellow pilgrims with many interesting stories to share along the way. 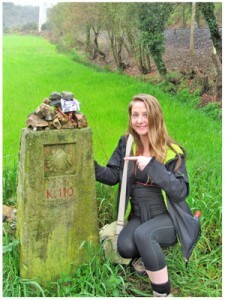 She is also writing a detailed account of her Camino walking adventure on the Mooney Blog Page. Listen to Katriona’s original Camino de Santiago report on the Mooney Show.